Posted on Tuesday, October 18th, 2016. - Filed under 55-Inch. OLED55C6P and 55EG9100 are two 55-Inch curved OLED TVs that you may consider in 2016. OLED55C6P is part of LG’s 2016 OLED TV lineup, while 55EG9100 is part of the older LG’s 2015 TV lineup. As two 55-Inch curved OLED 4K TV, you can find that there are few similarities between those two TVs. While there are also some differences between them. What are their similarities and differences? I’m sure that you need to know their similarities and differences before deciding which of them is the one that you should choose. What are the Similarities Between OLED55C6P and 55EG9100? As your options for 55-Inch curved OLED 4K TV, you can find there are similarities between LG OLED55C6P and 55EG9100. Let’s talk about their similarities together. LG OLED55C6P and 55EG9100 come with OLED screen. OLED screen is able to deliver perfect black with infinite contrast since the OLED pixels can be switched off completely as well as brighten and dimmed autonomously. While the curved panel design that used by those two TVs offer the new panoramic watching experience. Both of LG OLED55C6P and 55EF9100 comes with WebOS as their Smart TV platform. With WebOS Smart TV platform, you can enjoy premium entertainment on your TV screen while you can also run additional apps with the access to LG content/Apps Store. They also both come with magic remote that make it easier to control the TV and its Smart TV platform. Passive 3D is also installed on both of LG OLED55C6P and 55EG9100. With additional 3D feature, you can enjoy both 2D or 3D entertainment in those two TVs. 3D glasses is also included with those two TVs so that you can enjoy 3D entertainment without any needs to purchase additional 3D glasses. The similarities of OLED55C6P and 55EG9100 can be summarized with the table below. 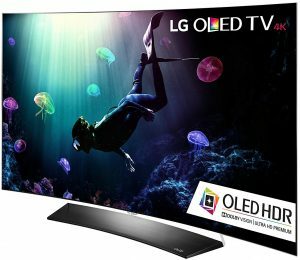 What are the Differences of OLED55C6P and 55EG9100? Besides similarities, there are also differences between LG OLED55C6P and 55EG9100. What are the differences of those two TVs? Let’s discuss that together. The screen resolution of LG OLED55C6P and 55EG9100 are different. LG OLED55C6P comes with 4K UHD resolution, while LG 55EG9100 only comes with 1080p Full HD resolution. Technically, 4K UHD resolution is able to deliver four times more brilliant picture quality than 1080p Full HD. So you can get more accurate details with LG OLED55C6P than what you can get with LG 55EG9100. HDR technoloy become more important in 2016 as It becomes more popular. That’s way LG introduced its OLED HDR technology for its OLED 4K TV in 2016. OLED HDR is able to bring improved brightness range so that you can get brighter whites and darker blacks on the TV screen. 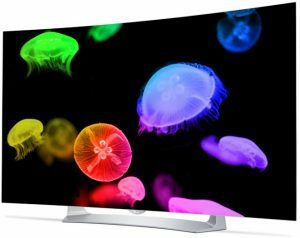 OLED HDR is only installed on the new LG OLED55C6P. It also supports Dolby Vision that used by major studios so that you can enjoy the movies just like what the director intended. We have talked that both of OLED55C6P and 55EG9100 is completed with WebOS as their Smart TV platform, but They are different in version. OLED55C6P as part of LG’s 2016 TV lineup comes with the newer WebOS 3.0 as its Smart TV platform, while LG 55EG9100 as part of the older 2015 TV lineup comes with WebOS 2.0. WebOS 3.0 comes with improvements from the older WebOS 2.0 so It becomes more user friendly and stable. The speaker system installed on those two TVs are different. LG OLED55C6P comes with 4.0Ch 40W speaker system, while LG 55EG9100 comes with 2.0Ch 20W speaker system. With 4.0Ch 40W speaker system, you can experience more immersive sound quality in LG OLED55C6P. While LG OLED55C6P speaker is also designed by Harman/Kardon so you can get more beautiful sound in LG OLED55C6P than what you can get with LG 55EG9100 that’s not designed by Harman/Kardon. As the newer and better model, you can easily guess that LG OLED55C6P is more expensive than LG 55EG9100. How much is their price difference? You can find that commonly LG OLED55C6P is around $700 higher than LG 55EG9100. But for sure that price difference is not fixed since the price of those two TVs are changed by the retailers from month to month. Which 55-Inch Curved OLED TV Should You Choose? Related Post To LG OLED55C6P vs 55EG9100 : Which 55-Inch Curved OLED TV Should You Choose? LG introduced its LG 55UH6550 model in 2016 that can be said as the successor of LG 55UF6450. As the successor model, you can find some similarities between LG 55UH6550 and the older LG 55UF6450. Are there any..
UN55KS9000 and UN55KS8500 from Samsung are two options that you may consider when you are looking for 55-Inch Smart 4K UHD TV and you consider Samsung’s SUHD TV series as your choice. Samsung UN55KS9000 is positioned as the top..